This post is about something I missed in Monaco. There are many cities where walking tours are offered. We have taken some of those and are quite enjoyable. Not only they guide you through the city, but you get to look at the right spots in the right places, you listen to some of the stories that make up the history of the city, etc. We generally regard those walking tours as good value for money. I missed such a tour in Monaco (and if it exists, we didn’t see it announced in the guide). Let me share with you how easy it would be to organise it. I would pick the circuit of the Formula 1 GP of Monaco as a reference. By the way, I found no explicit reference to it in the guide or in the city, you need to make it up yourself from memories of having watched it or check it in the internet (where normally it is not displayed street by street). 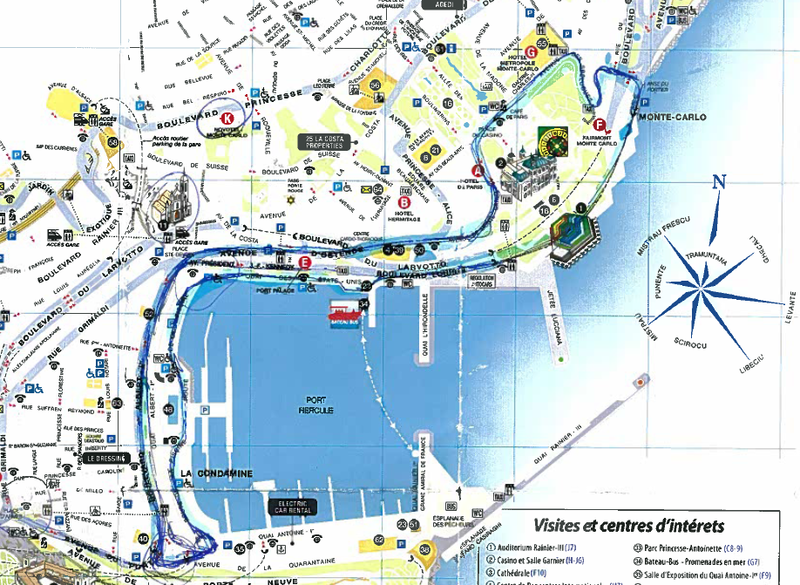 "Monaco GP Walking Tour" following the Formula 1 GP circuit. Departure at the starting line of the GP at Boulevard Albert I: from there you could easily venture to the left to see the centre of La Condamine, Rue Princesse Caroline, maybe walking up to the Place d’Armes to see the market. Back to the circuit you would just go ahead till the first curve and visit the church Sainte Dévote, which gives the name to the curve in the race. Taking the avenue d’Ostende up, you could venture to the Carré d’Or gallery, which is actually recommended in the guides. There you can see all kinds of luxury items’ shops (most of those brands don’t even ring a bell to me). Leaving Av. d’Ostende you would continue to the Av. Monte-Carlo where you could visit the Casino, take some pictures in the gardens, admire the cars at the front (that spot is one that apparently every Porsche, Ferrari, Jaguar, Maserati or the like has to pass by no matter where they go :-)) and take a drink at the Cafe Paris (all activities that are recommended in the guides). Leaving Av. Monte-Carlo you would take the Av. des Spélugues where you would admire its curves, steep slope down and F1-like road borders. Down at the Boulevard Louis II and prior to entering the tunnel, you could have a walk by the beach and see The Champions Promenade. You would then go through the tunnel to appear again at the harbour, where you could admire the yachts. Turn left at the Route de la Piscine (which last weekend was used for ice-skating) and end by having a final drink at the bar of the last curve, La Rascasse. With this simple walk, of no much more than the 3.3km of the official Formula 1 circuit, you would have visited most of the highlights except for the Rocher, where the cathedral, the aquarium and the Palace are located. If the walking tour was guided, someone knowledgeable of the city could tell you about the prices of houses, VIP residences, sums played at the casino, owners of biggest yachts, firms selling at the Carré d’Or, famous stunts and overtakes at F1 races history, etc, etc. As far as I know, there is no such guided tour, above you have my two cents.